Teruel - a city in Aragon, Spain, the capital of the province of the same name. 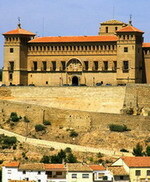 It has a famous cathedral in the Mudéjar style. Another church, San Pedro, keeps the mummies of Isabel Segura (a rich lady) and Diego Mansilla (a poor man) whose love ended tragically. This story was subject of a book and an opera composed by Tomas Breton. There is a very small statue of a bull, called Torico ("little bull"), located in the Carlos Castell Square (known as Torico Square). Touristically the town and area are unknown, but well worth the visit. A traditional-style hotel featuring tall, shuttered windows and ornamental balconies. 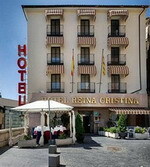 The hotel is situated in the heart of the historical quarter of the city, 250 metres from Plaza del Torico. Guests can relax with a coffee in the café or watch television in the lobby before heading out to explore the city. The restaurant Reina Cristina is a traditional-style restaurant with white linen-topped tables serving dishes made using fresh, locally-grown produce. After a meal in the restaurant guests can dance the night away at the disco. There are plenty of attractions within easy walking distance of the hotel, including the Mudejar Towers 300 metres away, and the city cathedral 350 metres away. The nearest airport is Zaragoza Airport, which is 120 kilometres from the hotel and takes around 90 minutes to reach by car. On the outskirts of historic Teruel, the hotel is a perfect expression of the mixture of cultures and styles of this interesting and monumental city, home to some of the most representative buildings of the Mudejar style. The hotel, a mansion inspired by this style, combines a plethora of styles and lines in its construction. Marbles, tiling, ogive arches and arabesque details form part of delightful, spacious rooms in pastel tones. There is also a large garden with a swimming pool, tennis courts, and suites appropriate for holding conventions, meetings and social events. Specialities and traditional dishes - Don’t miss the local recipes served in the Parador’s restaurant: migas a la pastora (breadcrumbs), lamb stew, soup ‘en perolico’, lovers’ sighs... cooking for the most demanding palate. Built on the la Cumbre Cerro Pui Pinos hill top, the 12th-13th Century castle-convent was converted to the seat of the Order of Calatrava in 1179. 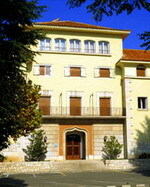 The Parador, which dominates the Maestrazgo landscape, has preserved the Tower of Homage, the belfry-sacristy, and the section converted into an Aragonese Palace in the 18th Century. The interior features gothic murals, a Plateresque sepulchre and baroque façade decorated with red, ochre and green shades as well as oak beams. There is also a peaceful garden area. The hotel provides a large number of excursions and adventure sports activities. You must try the huevos a la alcañizana (Alcañiz-style egg dish), ternasco asado (young roast lamb), or the tortas de Alma y los almendrados (almond tart). Somontano and Cariñena wines are the perfect accompaniment for enjoying these culinary delights.